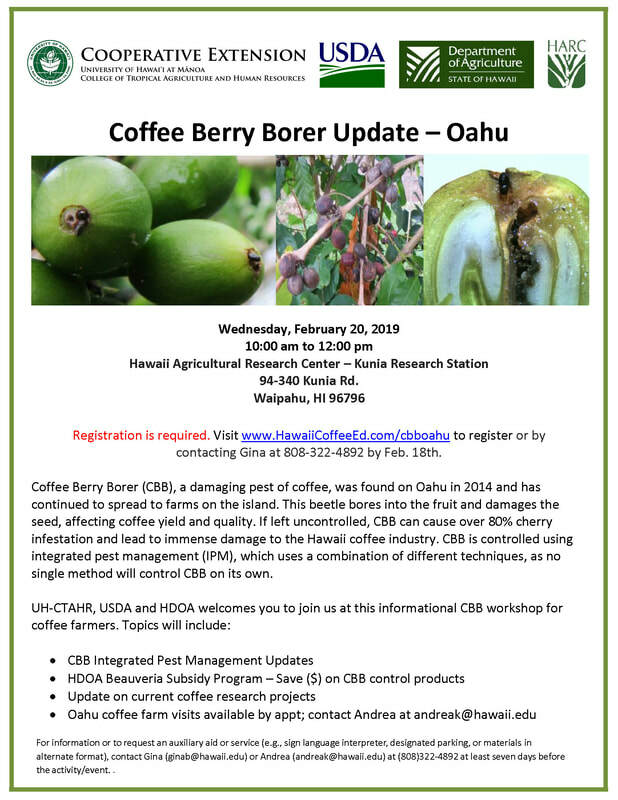 CBB Update Workshop - Oahu - Welcome Coffee Growers! Registration is required. RSVP at www.HawaiiCoffeeEd.com/cbboahu or by contacting Gina at 808-322‐4892 by February 18th. Coffee Berry Borer (CBB), a damaging pest of coffee, was found on Oahu in 2014 and has continued to spread to farms on the island. This beetle bores into the fruit and damages the seed, affecting coffee yield and quality. If left uncontrolled, CBB can cause over 80% cherry infestation and lead to immense damage to the Hawaii coffee industry. CBB is controlled using integrated pest management (IPM), which uses a combination of different techniques, as no single method will control CBB on its own. This workshop is funded by UH-CTAHR, HDOA, USDA and HARC. Click above to view and download the event flyer. Please contact Matt at mnmiyahi@hawaii.edu or call 808-322-4892 if you are unable to make the workshop. We would like to provide someone else with the opportunity to attend if they are on the waiting list.